President of the institute of Toastmasters of Great Britain. President of the Guild of Essex Toastmasters. When planning their wedding day, it is certain that every bride and bride groom will take steps to ensure that it will run smoothly. Regrettably however, it is certain that at some time they will have been to a wedding that lacked that important 'sparkle'. On reflection, the most likely reason for that was that no one was on hand to co-ordinate the reception etiquette procedure and generally to take care of all those little unforeseen emergencies that however carefully things have been planned, can always arise, you may not want to take the chance that this will happen on your special day. Customary matters such as the receiving line, the cutting of the cake and of course the speeches all have to be managed. The advice of your Toastmaster which is available to you from the moment the booking is confirmed can often prove invaluable. It may be that up until now you have not thought of engaging such a person for your wedding reception. 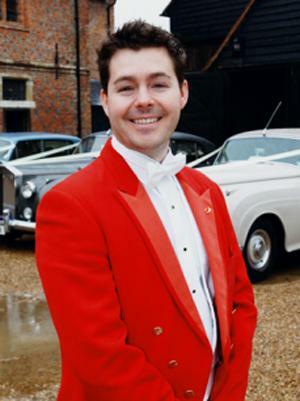 Possibly you feel that a formally dressed, red coated Master of Ceremonies to be 'over the top'. We can be as formal or informal as you require. Past President and Chairman of The Guild of Essex Toastmasters. 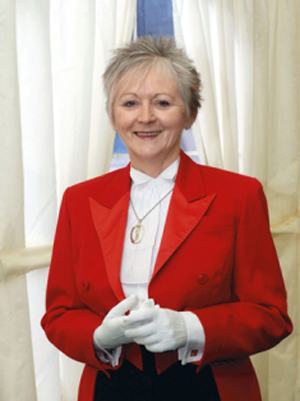 For those who would prefer a Lady Toastmaster, Evelyn Frances is fully qualified and a Lady Toastmaster in her own right. Looking immaculate, Evelyn will add ‘presence’ grace and elegance, whilst following the protocol required. Evelyn’s level of personal service and attention to detail matches her peers stride for stride and we would love you to see the many letters of thanks and appreciation she receives. See her testimonials page. Evelyn will be honoured to officiate at your special event, whether it is formal and traditional or you are wanting a more modern and relaxed occasion with a degree of formality and control over proceedings. Friendly and approachable her smile is her trademark and Evelyn will be pleased to discuss your wedding with you at any time. The modern day Toastmaster has the ability to adapt to the particular requirements of each individual wedding and her experience enables her to be either the formal professional or the informal link-man, as the circumstances require. 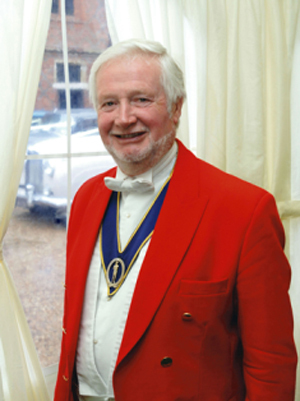 Toastmaster David lives near Colchester in Essex and offers his Toastmaster services throughout Essex, Suffolk and the surrounding towns and cities. He is the lead singer with his own band and can offer a full package. David has been toastmaster for a number of years and having a background in directing, singing, drama, and the performing arts, he has the skills to perform to the highest level of professionalism for your special occasion. The picture shows The President Mervyn V C Rutter along with The Lord Petre HM Lord Lieutenant of Essex and The Worshipful The Mayor of Colchester Cllr. Colin Sykes Plus The President of The London Guild Of Toastmasters Arnold Brooks. 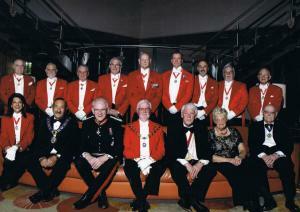 Members came from all over Great Britain to the week end which saw the installation of the new President Peter Morrall.